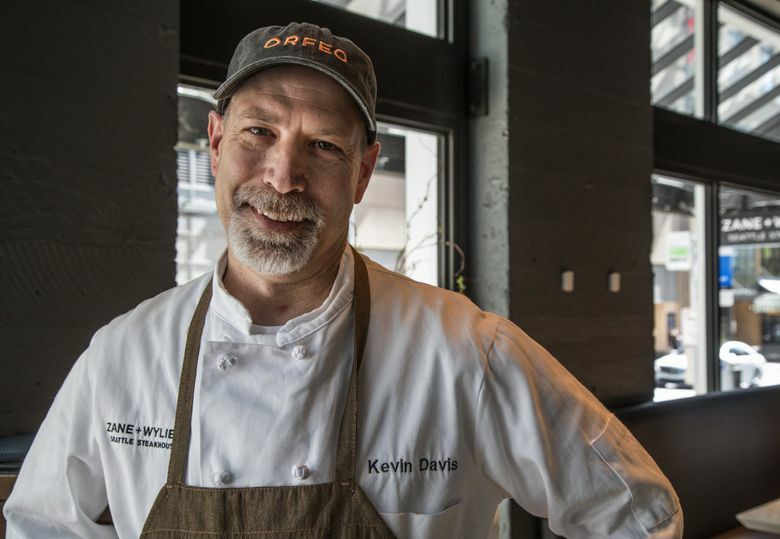 On the local steakhouse spectrum, Zane + Wylie’s is closer to JaK’s Grill than Metropolitan Grill, says restaurant critic Providence Cicero. What does it say about a steakhouse when seafood is its stronger game? 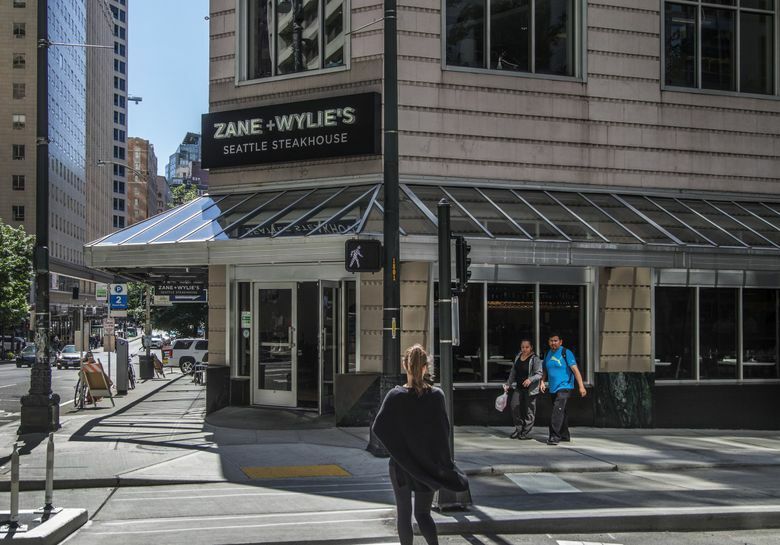 I enjoyed my steak at Zane + Wylie’s Seattle Steakhouse, but the caviar pie, razor clam chowder, broiled oysters, grilled shrimp and hazelnut-crusted halibut are more likely to bring me back. On the local steakhouse spectrum, Zane + Wylie’s is closer to JaK’s Grill than Metropolitan Grill. The prime steaks and chops on the dinner menu are either grilled or cooked on a plancha. The rib-eye appeared to have come from the latter. Cooked to the specified medium-rare, the steak had a hard sear on top and bottom, but no char around the edge. An imposing double-cut pork chop had noticeable grill marks. It was oven-finished, though still quite rare at the bone. 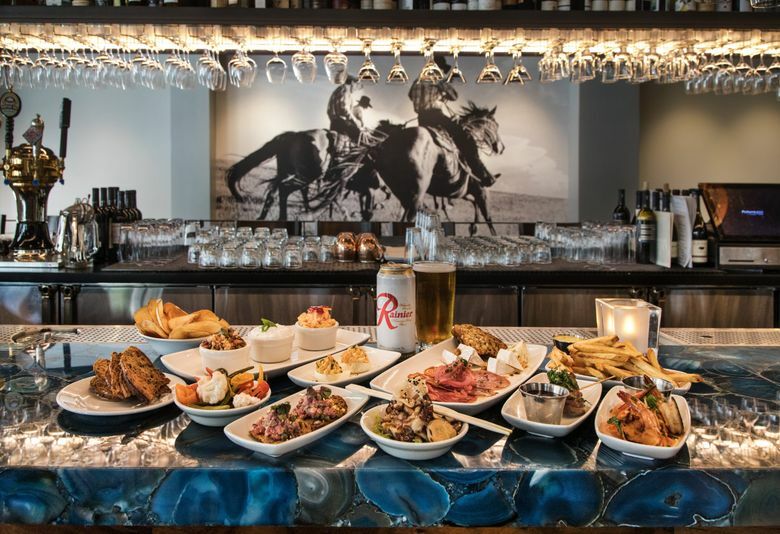 The package prices ($34 for the pork chop, $48 for the rib-eye, $46 for the New York strip or tenderloin, $52 for lamb chops) include a house salad, sautéed vegetables and a baked potato preloaded with sour cream, green onion, cheddar cheese and bacon. Not a bad deal if the sides and sauces measured up. A steak sandwich and a burger are less expensive dinner alternatives, if it’s beef you’re after. The unfussy burger is a winner. It comes stacked with the essentials — a hand-formed wagyu beef patty, good bacon, aioli. Pickles, onion, lettuce and tomato are on the side amid a pile of fries. I was impressed when the waiter said they use prime N.Y. strip for the steak sandwich. (“There are no crappy cuts here,” he said.) Underneath the peppers, onions and provolone, there was indeed very good meat, so why not slice it rather than chop it randomly, gristle and all? The burger and the steak sandwich appear on the newly introduced lunch menu, along with a steak salad and wagyu hanger steak frites. But the lunch roster also incorporates some dinner entrees that are downsized and lower-priced. Neah Bay halibut with roasted potatoes, for example, was a $38 entree at night, but only $18 at lunch for a portion that did not seem at all meager. The fish was well-served both by its mantle of hazelnuts, breadcrumbs and cheese, and the vivid green herb sauce swirling around it. At lunch, too, you’ll find one of the best kale salads around. The slivered greens, tossed with lots of chopped pickled vegetables, briny olives and lemon, are a fitting grandstand for three jumbo grilled Gulf shrimp. Starters are the same day or night. Do order the warm, soft, molasses bread. Each individual loaf comes with salted, honey-dappled butter. New England-style razor clam chowder goes easy on the cream and the herbs, heavier on the bacon and potatoes. Mine lacked the “truffle oil drizzle,” but I didn’t miss it. Great baked oysters from Barron Point brim with garlic butter, bacon crumbles and a touch of Parmesan. Caviar pie nearly duplicates the original I remember fondly from Steelhead Diner’s early days. A wedge of it — chopped hard-cooked egg on the bottom, cream cheese and sour cream in the middle and big pearls of wild salmon roe on top, shored up with chopped capers, red onion and whole grain toast — is a delightful indulgence. Sides are portioned to share. Be sure to get the green beans, seared to golden-brown tenderness, crunchy with roasted hazelnuts and zesty with orange. Be wary of escarole cooked far past “wilted.” When it comes to pastry chef Jessica Campbell’s desserts, especially her key lime chiffon pie and a cherry tart with white-chocolate ice cream and crème anglaise, maybe order one of each; you won’t want to give up a bite. Zane + Wylie’s replaced the short-lived, froufrou Circadia. The décor has morphed from raunch to ranch. Gone are the crystal chandeliers and the turquoise velvet upholstery. Now there is earth-toned leatherette covering the barrel-shaped booths, drum-shaded overhead lighting and wood paneling where wallpaper once shimmered. The Davises banished linens and draperies and reinforced the macho vibe with a mural of wranglers on horseback from the “Cowboy Series” by American photographer Laura Wilson. The place looks like the sort of restaurant Seattleites would actually wander into. I hope many will.